We manufacture privacy screens that can be used in a variety of ways. These might include, hiding a water tank, shading a window, blocking the view to or from your neighbours. Also to cover your wheelie bins or to enclose a deck or alfresco area. We will custom make to your requirements. Again they can be powder coated in a variety of colours to suit your decor. 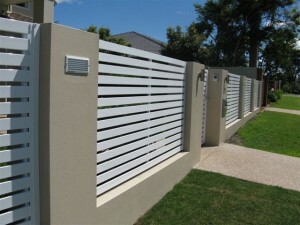 Standard slat style privacy screens are manufactured using 65mm x 16mm aluminium with a minimum gap of 10mm.